I don't care for salmon, but can definitely put tomatoes in my guac! Yes to tomatoes and avocados, but no to salmon. I don't want any animal to die on the off-chance that eating it may make my skin look nicer. Make sure to combine the tomatoes with some fat to absorb the vitamins and lycopene. So eating with the guacamole would hit the spot! 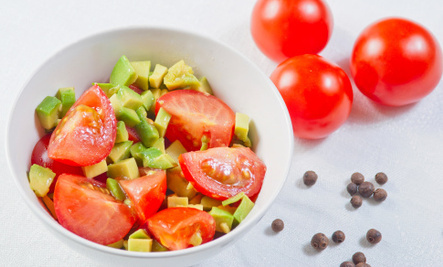 I love avocados with tomatos and onion. Olive oil sprinked on it would be good also.